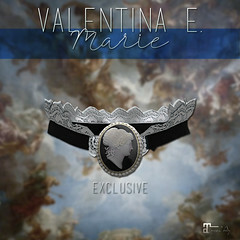 January 2016 – Valentina E.
NEW! Valentina E. Sweetheart Lace Bra & Undies, exclusively at UBER opening January 24th! Available in four color options and Maitreya Lara, Slink Physique/Lara, and Standard S/M sizes. We hope you like it! NEW! Valentina E. Katherine Bodysuit & Tailored Trousers @ Shiny Shabby! NEW! Valentina E. Katherine Knit Bodysuit & Katherine Belted Trousers out exclusively at Shiny Shabby January 20th! Available in 5 sizes (three for mesh bodies, two standard sizes) and 4 color options. Don’t miss it! NEW! Valentina E. Suede & Brocade Ensemble @ The Epiphany! Coming to The Epiphany Gacha Event, our new Suede & Brocade Ensemble exclusively for Maitreya Lara! Don’t miss it! NEW! Valentina E. Chained Angel Dress @ The Mesh Body Fair! Coming January 10th for The Mesh Body Addicts Fair, our new Valentina E. Chained Angel Dress designed exclusively for Maitreya Lara. Available in four colors, all with gold and silver chain options. Don’t miss it! NEW! Valentina E. Satin Chemise & Skirt @ Chapter Four! NEW! 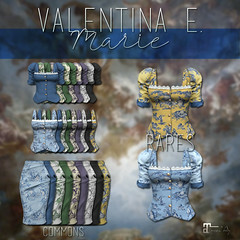 Valentina E. Satin Chemise & Mini Skirt coming to Chapter Four! Maitreya Lara & Slink Physique sizes are included and four color options are available. Don’t miss it! NEW! Valentina E. Renee Dress @ FaMESHed! NEW! Valentina E. Renee Dress out now at FaMESHed! Find it in four color options and Maitreya Lara & Slink Physique sizes. Don’t miss this classic dress!